If you own a high-traffic commercial or retail space with terrazzo floors or a home with terrazzo that's been hidden under carpet or some other surface or you've had terrazzo floors for years and years, you may not be happy with the appearance of your terrazzo. Perhaps you are considering other flooring options because of the amount of time and effort needed to get your terrazzo looking decent, not to mention the money you spend on expensive stripping, cleaning, and waxing products. Before you invest in covering your terrazzo, consider having it restored instead. Imagine your terrazzo restored to its mid-century modern glory with a natural finish that is oh-so-easy to maintain. When we say easy, we mean it. No more stripping and waxing! Just a quick sweep and a damp mop. We can give you the terrazzo of your dreams, restoring it using the same process as that of marble restoration. 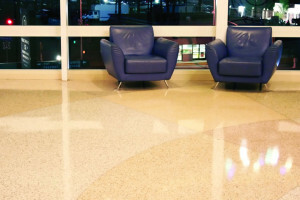 Terrazzo, a unique stone comprised of marble chips in a variety of sizes and colors in a cement, resin, or epoxy base, can lose its appeal and become dull, scratched, and dirty-looking. Other terrazzo problems include holes from carpet tacks or nails, cracks and chips, and stains. A beautiful shine on terrazzo, unfortunately, only lasts a short while if improper restoration methods are used. Dirt, grime, and other contaminants become embedded in coatings, making the floor ugly and unsanitary. Coatings have to be completely removed and replaced as often as every three months. If coatings are not completely removed, then each passing strip-and-wax creates a new layer of yuck that builds up and scratches and scuffs easily. Fortunately, all of the above-mentioned problems can be resolved. There's a reason terrazzo is found in homes, apartments, restaurants, stores, hotels, hospitals, schools, and busy office environments. When properly repaired and restored, it is incredibly beautiful, and resilient, too. Classic Marble and Stone Restoration provides expert terrazzo repair services. We can fill in chips and cracks, and for holes, use tinted filler with aggregates (little pieces of marble) that patch your terrazzo. Once your floor is honed and polished smooth, the repair site blends right in with the surrounding finish. Classic Marble and Stone Restoration provides expert terrazzo restoration services. We can virtually erase the scuffed and scratched surface layer with our grinding and honing processes, revealing the brand new stone underneath. With the damage removed, we can hone and polish your terrazzo to a velvety smooth satin/matte finish or a glossy, elegant polished finish. To help inhibit stains, we can apply an impregnating sealer. Regular cleaning and janitorial services are valuable for simple, day-to-day care of terrazzo floors. But over time, their processes leave floors with grout lines that just won't come clean, shiny scratches, and increasingly obvious traffic patterns. As these problems develop, you become more and more dissatisfied with the appearance of the floors until it's time for another round of professional restoration. With our regularly scheduled maintenance program, your floors can look great all the time, without the need for periodic restoration. To make terrazzo shine, it is commonly coated with a wax. The problem is, waxed surfaces have a tendency to collect dirt and to yellow over time and require a perpetual —and costly—cycle of stripping and re-waxing. We offer solutions that break this cycle of stripping and re-waxing, saving you thousands in annual maintenance costs, while achieving better results. We can achieve a gloss or matte finish using either a natural polishing process, which produces a beautiful and lasting finish, or when called for, treat your terrazzo with our New Generation coatings which perform brilliantly under pressure. This option creates a protective and beautiful finish that doesn’t yellow, lasts years under the heaviest traffic, and increases slip resistance while preventing the spread of secondary infections through anti-microbial properties. Visit our Specialty Solutions page to learn more. For a free estimate on terrazzo polishing, terrazzo refinishing, and terrazzo repair in the Philadelphia and Delaware Valley area, use our online contact form or call (610) 356-4100 today.